Don’t run away screaming from this recipe please. I know that it’s snails. We all know Escargot Forestiere is snails. Just stay for a while and read on, ok? 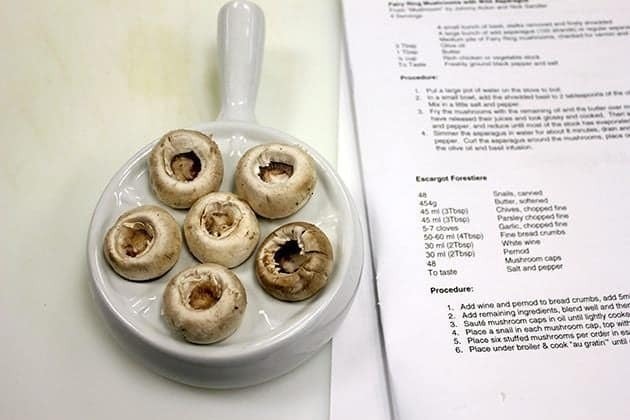 This delightful recipe was part of my class that I took on wild mushrooms in September. How can you hunt mushrooms and not make stuffed mushroom caps? I must admit that these are not the first thing I would think of when it comes to stuffed mushrooms and it’s not that I don’t enjoy escargot. I’ll eat just about anything that’s not an insect. Or a frog. Ew. Sorry. If you’re actually still reading this- bless your heart if you made it through the snail and frog talk- this is a lovely recipe to whip up for company who might live on the wild side. I find that most people are willing to try snails and indeed, I am sure that everyone in the class did eat some. More than some, if the person happened to be myself for I find this a delectable little dish that I actually enjoy for the taste, not just the thrill of eating Gastropoda. You like how I threw that in? And you thought I was just all good looks. Go forth and talk about Gastropoda. This is a large recipe for 8 with each person having their own escargot dish containing 6 snails. 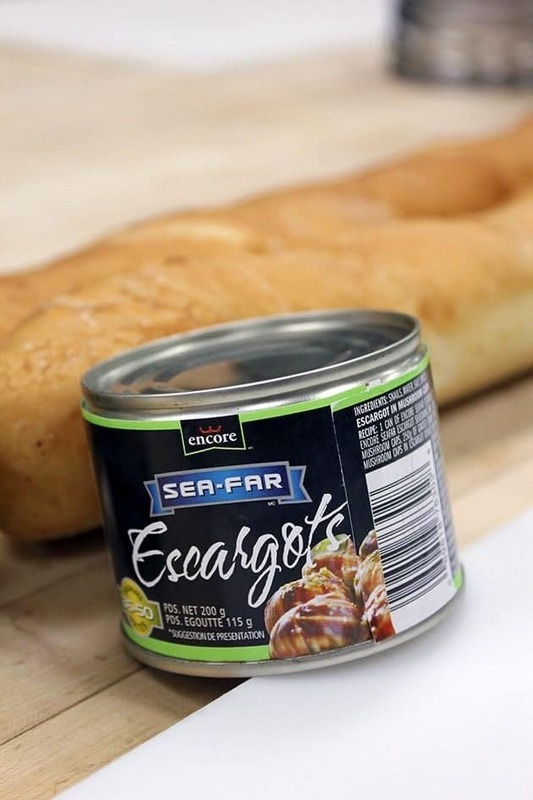 If you are wondering where to find escargot dishes, rumour has it they are readily available at dollar stores. 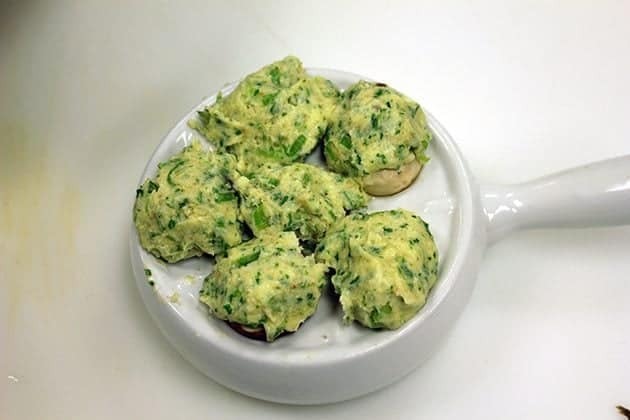 I think it’s a worthwhile investment for dinner parties, that big ol’ 8 dollars because you can omit the snails if you must and simply serve a wonderful stuffed mushroom appetizer to each guest when you entertain. I spotted the cans of escargot awaiting us in the kitchen and cackled to myself, thinking of the reaction they were going to elicit from everyone. My classmates didn’t disappoint, either. Snails just tend to have that effect on people. Take your mushrooms, wash then remove the stems. Small ones that fit just so in the escargot dish are the size we are looking for. We used small white store bought mushrooms for these, as we didn’t have 48 mushroom caps of any one sort that we picked. What is pernod you ask? A liquor similar to Ouzo and a successor of absinthe,very anise/black licorice tasting and smelling. A word on the wine as well, I have heard it many times before but our chef emphasized using only good wines in cooking. The qualities that make a wine poor or unpalatable are only going to be brought out even more by cooking with it. Use a wine you would drink and enjoy when you cook with it. Don’t ruin a great dish with crummy wine. Top with a generous amount of the garlic butter mixture. Like I did. I almost overdid it. Place under a broiler and cook “au gratin” until they are golden brown and heated through. Wanna hear something gross? Wanna know how to tell that the snails are heated through? The entire cooking class all sat in utter silence listening to the salamander broiler…waiting….listening..until we started hearing POP! POP! POP! Just like popcorn. And the snails were done. Fascinating and gross at the same time. 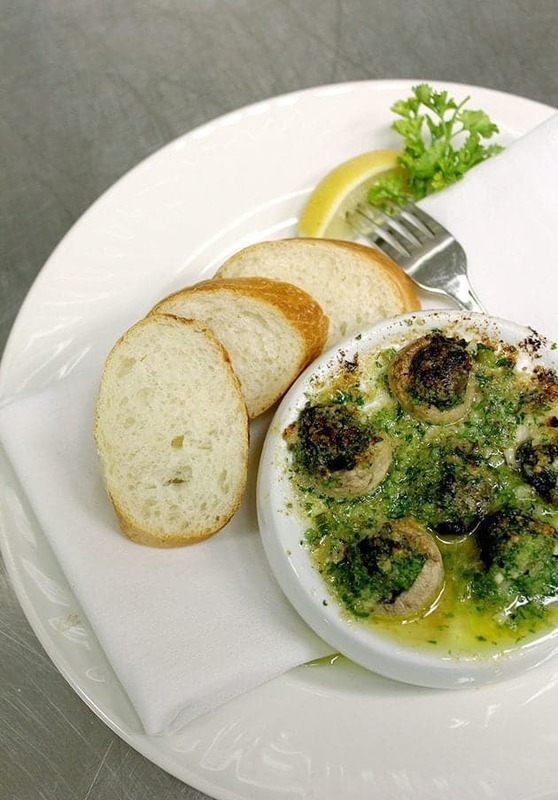 Plate the escargot dish and serve to hungry guests. And cross your fingers. I don’t believe I have ever written that before about a recipe, “cross your fingers”. I guess this is just one of those famous yet hit or miss dishes. Either a person can get over the whole “snail” bit and enjoy this amazing garlicky, buttery amazing goodness or they just won’t and that’s that. I hear you on the frog thing. I went to a party were we had to bring something most people wouldn’t have tried. I brought BBQ frogs legs. Couldn’t get past it, didn’t even try one. People said they were good, like chicken wings. I’ll stick to the poultry variety for my wings thank you. The only differences between my recipe and yours is I double the Pernod and I also add grated parmesan cheese to each divot in my escargot crock. Delicious!! Which dollar store would you recommend I start with? Very yummy recipe! Used to eat stuff like this all the time when I lived in Europe 9 years ago. Thanks for posting. 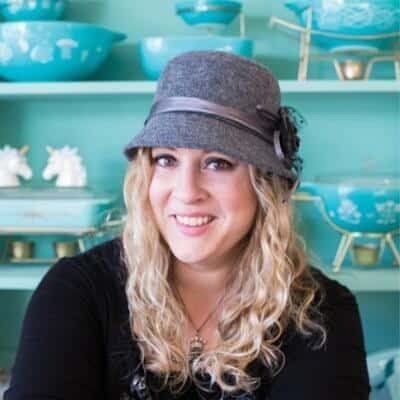 Came upon your beautiful site just now and was thrilled to see another fellow magpie 🙂 My nickname is Magpie and I cook, bake, garden, blog and don’t clean too 😀 So great to meet you and your lovely recipes! Loved the juicy buttery escargot I had recently but would never have thought to cook it at home. Oh and frogs legs are supposed to taste just like chicken- they are a delicacy where I come from but I wouldn’t touch it either. Well I might now, but not back when I was a picky kid. And gosh! Do you have a thing for stuffed cookies too?! We could be twins! Nice to meet you fellow Magpie!!! Yes indeed, stuffed cookies are one of my many things lol! This recipe sounds amazing, I never shy away from ‘interesting’ food. 🙂 I am going to have to try this, my kids have never tried snails. I remember as a child trying snails when we went to France on vacation while my Dad was stationed in Germany. My mother and siblings cringed when my Dad and I honored it and it came to the table. I reveled in eating them proudly, initially trying them to get a reaction then once I tasted that butter, garlic and herbs I was hooked. One of my earliest food experiences that would stay with me and open my mind to the odd bits and that I should give that stuff a chance. You know you did a good job with the write up and pictures when someone reading your post at 6 AM wants to eat snails! Well done! Hahaha thanks John for the photo compliment, I shot it without natural light so I appreciate that they look ok! Anything is good with butter n’ garlic on it, I swear!